Step back into a simpler time when entertainment was pitching horseshoes at small metal stakes in the ground. Practice your throwing skills and compete with family and friends for the most “ringers” in your group. If you don’t get a ringer, remember “close” does count in horseshoes. 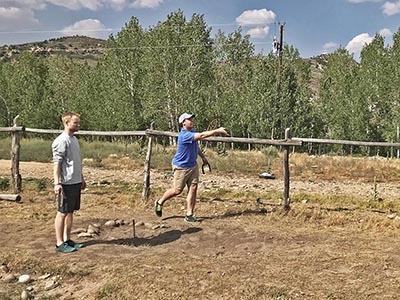 Horseshoes is a “free-time” activity and equipment must be checked out from the Trading Post.